in pink *squeal* and the frenchy aqua chair. This lovely image was posted by Lily of Opulence. and my new favorite color, aqua! Robins Egg Blue, Tiffany Blue...its all good! While everyone else is hooking up with autumnal golds and browns.... I'm lusting after this combo. I have around my house for another week or so. Like this vintage plate I got junking in NH this summer. This pile of frenchy pillows in pinks and blues are summerlicious! I pile my pillows up on old aqua blanket chest that hides my recyclables. Limoges demitasse set in painterly aqua and pink in the wispiest shades was another NH score. My old favorite chintzware pitcher and a "new" old platter share pretty blues and pinks. 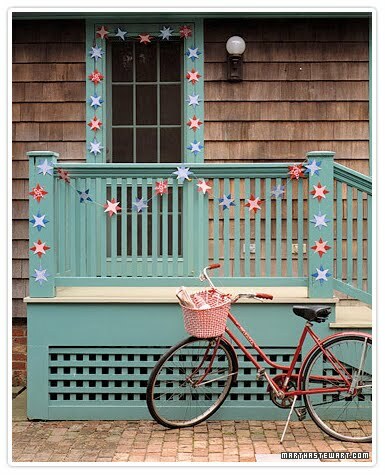 Martha Stewart.com shows a bike in rosey pink in front of an aqua porch. I have the aqua bike and am now going to paint my bike basket pink! blues, purples and pinks, but it's the aqua bag that grabs my eye! Wouldn't my rug from Company C below look perfect in this closet? I just adored this rug when I bought it on impulse, and I understand why. Aqua and Pink! Even though it went with nothing, I wanted to incorporate aqua into my home's color palette. good bye to the combo pink/aqua I adore. I am switching gears to usher in the fall. I'll see you two in the spring! I love the color combo of pink and aqua, and think you do it beautifully. I knew it was only a matter of time before you decided to paint that basket pink or yellow, LOL!!! Can't wait to see it!! I love the pink and aqua together. The platter you bought is just beautiful and I admired your rug awhile back...gorgeous!! Just by looking at my blog, you can see that I love that color combination! Actually, pale pale blue with just a tiny touch of green in it is my favorite color. If it gets toooo green, I don't like it. I had my kitchen painted that color once (until I had to paint it neutral in order to sell the house) :( and I loved the way it looked with my white marble counters and pink flowers in a pretty vase. Great photos and love that rug, too. What lovely photos of aqua and pink which is such a great color combination!! I know what you mean about the domino effect! I've been known to call it the snowball effect! But either way it definitely exists! I love all your pink and aqua pieces!! So beautiful!! I will keep all my beautiful rose china pieces some of which are pink and aqua. But I am going to a more traditional decorating style. More earth tones, browns, creams etc. Yeah, that dresser made me sqeal... and you are right, your rug would be perfect in the Traditional Home closet. LOVE that rug. I wonder what the pink striae background for the shoes shelves is (fabric, wallpaper, paint). Thanks for the great post. Mmmmmmmm........I love that combination too... My kitchen colors. :-) I love pale pink and yellow too....fabulous together. Be still my beating heart! THAT DRESSER...OH MY!!! WOW...OK, I better calm down, I adore your rug, the doggies on it are pretty great too, can't wait to see what you do for fall, everything you touch turns out amazing!!!!! great post - aqua all the way! 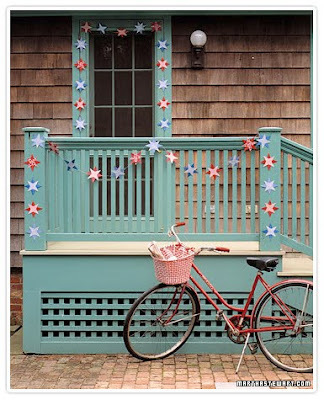 I am new to your blog and love your style, great pink piece wow..just gotta love that bike! These are beautiful colors together! I've enjoyed seeing aqua again in so many places in Blogland. I think your little fuzzy faces love your pretty rug too! oh, so sad to see them go! I love those colors! Such a happy color combination -- and you've shown us so many wonderful examples! Have a great weekend! Oooh... I do love that color combination, too! I love the picture of your chippy aqua blanket chest and floral pillows... so pretty! I just can't seem to get in the mood for fall decorating yet... soon. I am loving all of the wonderful blues & pinks! So much better than autumnal earth tones! Your pillows are just gorgeous! I there - found you from My Romantic Home. I love pink & aqua. Two of my favorite colors. Your rug is awesome. Just love how it looks. 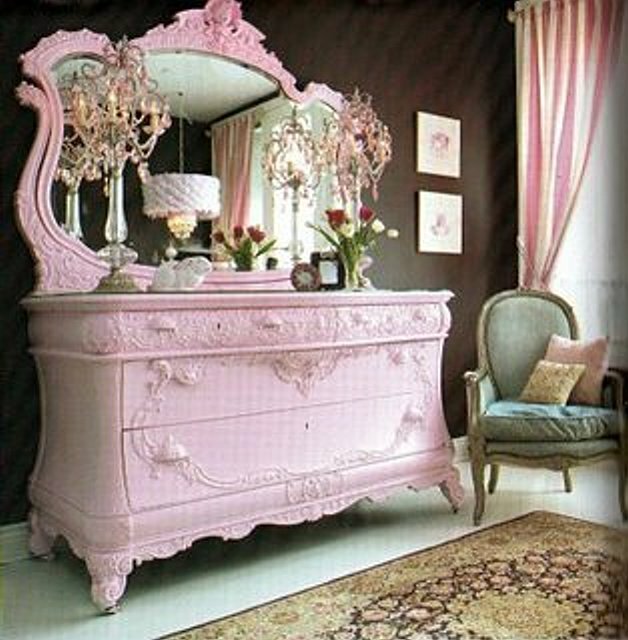 I just adore that pink closet! !